Called "Freedom Square" or "Freedom Circle" by rebels. Two story building with sandbag positions in corners of roof. Unfinished tree-story building of cinderblocks. Used by rebels as sniper position. 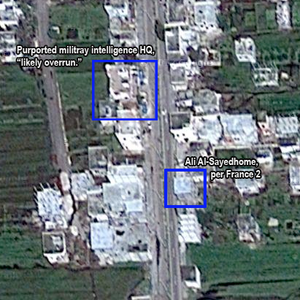 Street, 240 m "Satto Road", claimed attack route of Al-Hassan clan. Large building, two stories, battle damage in south-east corner, another building behind on alley 635. One faction Battalion Arabad bin guerrilla force clashing with treachery Asadi stationed at the National Hospital in Taldou – stars "Eric the Red"
small, maybe wing of building north. At exactly 890 meters from clock tower. 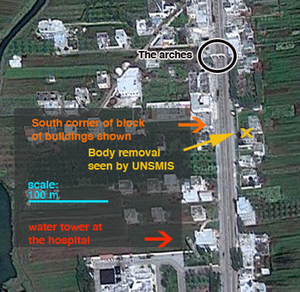 It is easier to measure distances from the gate than from the tower, so it is now defined to be at 890 m.
Two stories, drawn from street, bodies removed by UN, Ali visits house on September 14th, guide explains how one one victim was found sitting in corner, bloodstains on wall. This page was last edited on 18 November 2012, at 18:19.